Cebu City -- Early last summer, a friend of mine from New Jersey, Dr. JV Tuazon, a fellow writer on this website asked me how difficult is it to arrange a fight in the Philippines. I initially thought that JV was pulling my leg. But several minutes later in the conversation, I finally realized that the guy is serious. With his experiences, albeit very minimum, I thought it would not hurt if I can arrange a four round fight for him. In fact, I thought it would be fun. I made a few calls to friends in Cebu and I was advised the best way to land a fight is to hook up with the Aldeguers of Cebu. The rest of course is history. Last February 2nd, at the Waterfront Hotel in this City, JV fought a four rounder as an under card of the battle between Z Gorres of Mandaue and Vic Darchinyan of Australia. The card is a promotion of the Aldeguers of the fane ALA Gym in Mandaue, Cebu. Of course, as his friend, I flew in from Los Angeles to lend him a hand and support. Just to spice up the scene, I requested Salven Lagumbay of PhilBoxing to order a custom made a fighting outfit for JV from the fight pants to the colorful robe. JV looked so good in them. The outfit almost gave Lagumbay a heart attack. The tailor he commissioned to do them kept on procrastinating and almost did not finish the job. In fact, JV did not get his outfit until 5 minutes before he walk up to the ring. Talk about pressure. He almost climbed up the ring in his old shorts. When JV was given a go signal by the man himself, Mr Tony Aldeguer, the CEO of the ALA Gym, he made arrangements to come to Cebu a three weeks before the fight to get used to the hot Cebu weather and most importantly, to get trained by the gurus at the ALA Gym. Previous to that, he had been training in New York. But, all the hard work and the expenses did not quite turn out a positive result. JV lost via UD to a youngster from Sultan Kudarat named Rey Villar. The loss however did not deter Tuazon. During dinner after the fight in the company of Dong Secuya of PhilBoxing, this writer and the respected match-maker/promoter Sam Gello-ani, Tuazon expressed his desire to fight again soon. Sensing his serious desire to have at least another fight before he returns to New Jersey, Gello-ani promised to give him a fight sooner or later. JV also approached Mr Aldeguer and asked for another fight. As luck have it, Aldeguer had a card scheduled in Tagbilaran, Bohol under a joint promotion with Mayor Dan Neri Lim. on February 10th. 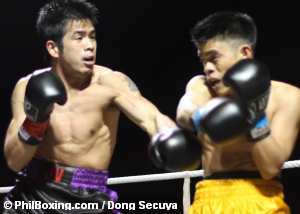 In his second fight, Tuazon hit pay dirt. He won his fight against another upstart named of Powell Balaban. JV won via a very convincing 2nd round TKO. Now that he has finally notched a win in the Philippines, JV will hopefully return to New Jersey. JV is a fairly good fighter. He is courageous and has a big heart. But, being a late starter in boxing, and knowing that he has a good job waiting for him in New Jersey, not to mention a gorgeous girl friend, my advice to him is to go home, ponder the future and see if he really likes to continue boxing. Personally, I would rather see him keep his day job. That is not to mean that I can not see him going further up the ladder. On the contrary, he has a fairly good chance due to his dedication to the sport and work ethics. However, personally, I feel one or two ventures to the big time is enough. It least it satisfied his desire to get a win in the Philippines. And, he is going home to New Jersey with a big “W” in the bag. But, if he desires to continue, I see no reason why I would not support his dreams. All the way! Top photo: JV Tuazon (L) takes the offensive against Powell Balaba en route to a second round KO win.